If you’ve heard of one cryptid from the USA, it’s Bigfoot. If you’ve heard of two? The second is probably Mothman. It goes back to 1966, a time of great social upheaval – and around the same time the Bigfoot legend took off. Hey, maybe America was just primed for supernatural sightings. Or bored. Or a portal to the otherworld opened up in the early sixties. Some people might tell you that’s where the hippies came from. Buuuuut that’s beside the point. The scene is a small, rural town along the West Virginia border. Point Pleasant nestles into the crook of the Ohio and Kanawha rivers. It’s November, 1966, and within one week eight people claim to have seen a human-like flying creature. A local gravedigger, one of a group of five, claims the first sighting. He says that he saw “something that looked like a brown human being” flying around. Uh. Way to bury the lede there, guys. Look, I know it’s 1966 and you live in a very white town, but if “brown human being” seems weirder to you than “flying human being,” you might want to take a quick reality check. He then claims that the airborne humanoid was visible for about one minute, but none of the other four men saw anything. Several days later, two young couples reported a much closer sighting. They drove out to the site of an abandoned World War II munitions plant late at night – now, that’s a pretty remote place. The kind that a pair of young couples might look for if they wanted a little, uh, privacy. Ah, young love. Imagine their surprise when they saw a pair of eyes watching them. It’s the stuff of classic American horror films. Well – perhaps the film studios had to get it from somewhere. As you can imagine, the four twenty-somethings were pretty spooked, and they did what any of us would: get the hell out of there. That’s where their story gets really weird – they say that the creature flew after them, with wings spread as far as ten feet, and chased them up to speeds of one hundred miles per hour. Okay, look, we’ve all told a few tall tales. It’s not hard to imagine that some young folks chatting up a reporter might stretch the truth a bit. But the basics of their story stuck in a few minds: a big, flying thing with glowing red eyes. His take? It was a big bird. If you’ve ever cringed at red eyes in a photo, you know that a flash – like the one from a pair of headlights – can make anyone look demonic. So if you’re wondering why anyone is still talking about Mothman now, you’re not alone. There wasn’t much talk of Mothman after that slew of stories in November 1966, and certainly not nationwide. So what changed? 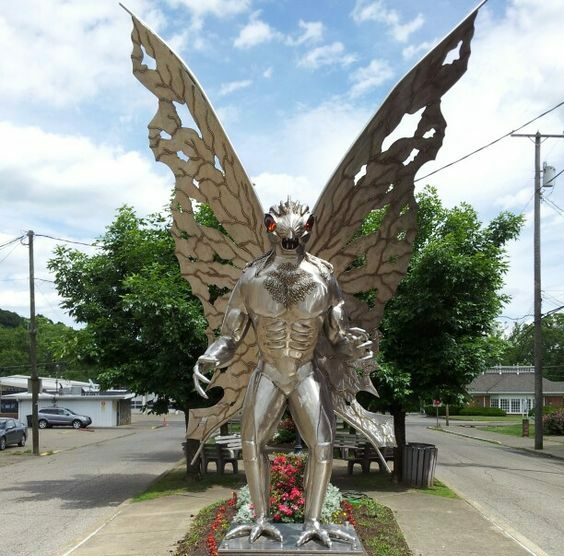 Point Pleasant made national headlines in 1967, but not for Mothman. On December 15th, the town’s Silver Bridge collapse shocked the nation, killing 46 people. It was a tragedy that forced American engineers to take a hard look at bridge designs and maintenance. It was also the subject of Gray Barker’s 1970 book, The Silver Bridge. Barker’s main claim to fame was UFO hunting. His books were rife with supernatural conspiracy theories, to the point that he’s credited with creating the government agents in dark suits are keeping alien secrets trope. In The Silver Bridge, he noted that there hadn’t been any Mothman sightings since the bridge collapse – and suggested that the cryptid was involved with the catastrophe. Barker brought Mothman to a national audience, a trend that continued with John Keel’s 1975 The Mothman Prophecies. Keel claimed that Mothman had appeared as an omen and caused the townspeople to see psychic visions of the bridge collapse. Keel and Barker were both UFO hunters, and both suggested that Mothman was an alien. And so Mothman took his place in American cryptid lore. But why has he stuck there? Really, though – what’s the appeal of the Mothman legend? From a purely physical standpoint, glowing red eyes are a striking visual. Mothman isn’t the first or last creature to glare at us from eyes like that, but it’s a tantalizing possibility for a living or once-living being. Add to that the fact that many of us have had an experience like that – think of a possum’s eyes reflected in the streetlights at night. Having something to connect to makes the legend feel more visceral. But what about the bridge collapse? Let me just say it up front – it’s awful to exploit a disaster where real people lost their lives so that you can sell books. But, whether or not you’re willing to give Barker the benefit of the doubt, the outcome is the same: the Mothman legend and bridge collapse have become linked in our cultural consciousness. Any time something terrible happens, it’s human nature to look for a reason. Sometimes there isn’t one. Sometimes the world is just arbitrarily terrible. Or sometimes there is a reason – say, a structural defect in a bridge’s suspension chain – and it’s just not good enough. Too mundane. We like to tell stories about ourselves so we can believe that we’re bigger than the insignificance we feel in the face of death. So we come up with reasons that are larger than life. Plus, Killer Moth was already a Batman villain, so it has that going for it. Well, that’s Mothman. So, what do you think – a cryptid worth remembering, or a Batman knock-off that just got used as newspaper filler? Sound off in the comments!